Falkirk’s finances will not directly benefit from Stephen Kingsley’s Scotland debut on Saturday. The Academy graduate, who signed for Swansea City two years ago and frequently returns to visit his former club, was a late call-up to Gordon Strachan’s squad for friendly matches against France and Italy. The left-back was then pitched in as a late substitute against the European Championship hosts France in Metz at the weekend in a 3-0 defeat for the national side. That prompted speculation the Bairns would net a windfall via the defender’s deal to the English Premier League. 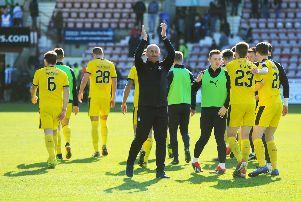 However The Falkirk Herald understands that though there is an international call-up clause in the agreement, there is no money winging its’ way to Westfield. The payment clause would only be triggered by Kingsley fulfilling the criteria during a competitive international match. Regardless, the Bairns are incredibly proud of their Academy product. Kingsley became the first graduate from the club conveyor belt to make the step into international football, since Darren Barr’s call-up for the senior national side in a match against Northern Ireland in 2008. Falkirk FC Chief Executive, Ronnie Bateman said: “We are delighted to see one of our Academy graduates going on to develop his career and achieving international recognition.